The Erlang C formula is quite complex to look at, but can be straightforward to apply, if you follow these easy steps. We have also included a worked example in Excel to help you follow the maths. 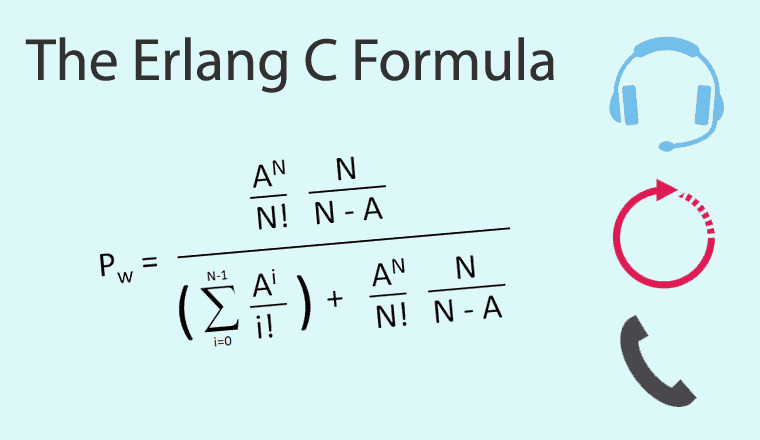 What Is the Erlang C Formula? The Erlang C formula is a mathematical equation for calculating the number of agents (advisors) that you need in a call centre, given the number of calls and the service level that you want to achieve. The Erlang C formula is the most important part of the equation. It allows you to work out the probability that a call waits (Pw), given the Traffic Intensity (A) and the Number of Agents (N) available. It was named after the Danish Mathematician A.K. Erlang, who developed the Erlang C formula 100 years ago in 1917. It is a derivation of the Poisson Formula – but using a special case where k=0. This assumes that the Average Handling Time of calls is distributed by a version of Poisson called the Erlang Distribution. For more information on this topic, read: How Is Average Handling Time Distributed? It Is Not How You Think! Before we start, we need a number of inputs. So, we have 100 calls per 30 minutes, which works out as 200 calls per hour. The traffic intensity is the length of time that all of the phone calls would take if ordered end to end. So if we have 200 calls with an Average Handling Time of 3 minutes, we would have a total of 200 x 3 = 600 call minutes. To work out the traffic intensity, take the call minutes and divide by 60 to get the number of call hours. So, 600 call minutes / 60 = 10 Call Hours. Now the technical unit for Call Hours is called an Erlang. So the traffic intensity = 10 Call Hours = 10 Erlangs. We now need to estimate the Raw Number of Agents Required to handle this traffic intensity. We know that we have 10 Erlangs (10 calls hours of traffic per hour). This means that the minimum number of agents that we would need in the call centre would be 10 agents. This figure of 10 agents would assume that all calls arrive at exactly the moment that a previous call has finished and that there is no queuing. So, we start with adding 1 to the traffic intensity. We then feed the Traffic Intensity (A) and the Number of Agents (N) into the Erlang C formula to see what is the probability that a call waits and then work out the Service Level. We then increase the Number of Agents until Service Level is met. You may also see it written like this. This looks scary so let’s look at the key elements individually and build it up in stages. N! 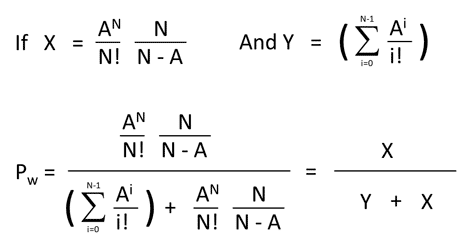 is mathematical notation for N factorial. So you need to cast your mind back to school maths. A factorial is the product of an integer (whole number) and all the integers (whole numbers) below it. For reference, here is a lookup table of the first 20 Factorials. We will need this for the worked example. Luckily, Excel has a formula that can do this for you. Note that factorials get very large as you increase the number of agents and very soon can cause Excel (and some computer languages) to overload, as highlighted below. 171! = 171 Factorial = FACT(171) = #NUM! The #NUM! shows that Excel is overloaded and can give you erroneous answers. On some Erlang Calculators you will see this Error written as NaN (Not a Number). So it won’t easily work in Excel above 170 agents. So, AN means A multiplied by A, N times. Now this looks scary, but it is simply adding together a sum of Ai / i! from zero to a maximum value of N-1. So, if N = 11 , N – 1 = 10 and we loop through from i= 0 until i = 10, as shown below. Σ is the mathematical symbol for the sum of a series, so you add together all of the results of the individual loops. where e is the mathematical constant (Euler’s number) and will always equal 2.71828. This is below the target of 80%, so we need to increase the number of agents. We keep on increasing the Number of Agents (N) by 1 to see if Service Level is achieved. We keep looping through steps 4 to 12 until we meet service level. This can be done by hand but can be a bit tedious. Service Level as a Percentage 64.0%. This is below the target of 80% so we need to increase the number of agents. Occupancy is the percentage of time that all call centre agents spend handling customer contacts. 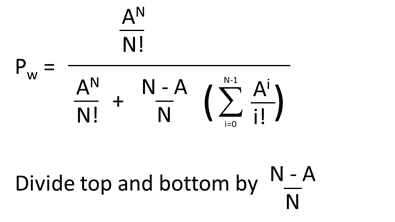 The formula is shown below. This is less than 85% so we can keep it at this. If you have an occupancy of more than 85%, your agents will likely get burnt out and you will find that Average Handling Time (AHT) may rise to cover it. There is a much easier (and faster) way to use the Erlang C Formula. 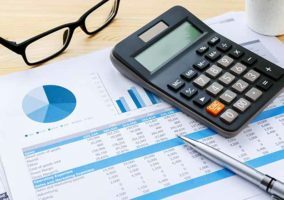 The added advantage of these calculators is that we have already figured out how to increase the calculations above the limit of 172 Agents and they are accurate to 10,000 Agents for the online Version and 600 Agents for the Excel Version. Also, if you want a spreadsheet that explains the Erlang C Formula you can download it here. Here is the Wikipedia Version. Now since u is traffic intensity (A), and m is the number of agents (n) we can substitute the equation. We can write the numerators and denominators of part of the equation in a different way. Now since dividing by a/b is the same as multiplying by b/a, dividing by (N-A)/N is the same as multiplying by N/(N-A). Which is our original Erlang C formula.